“This is a day of national grief,” Alberto Quintanilla, a leftwing congressman, told local television after confirmation of García’s death. García is one of four former Peruvian presidents to be sucked into the vast Odebrecht scandal – by which multimillion-dollar bribes were paid to secure construction contracts across the region – alongside Pedro Pablo Kuczynski, Ollanta Humala and Alejandro Toledo. Last week, a judge ordered that Kuczynski be placed under preventive custody for 10 days as part of a money-laundering investigation. Known as PPK, Kuczynski led Peru from 2016 until he resigned last March before a congressional move to impeach him over links to Odebrecht. Political allies from García’s once-powerful party, Apra, expressed shock and outrage at his dramatic death. Another ally, Mauricio Mulder, described García’s decision to take his own life as “an honorable act” taken in response to the “fascist persecution” of political foes. 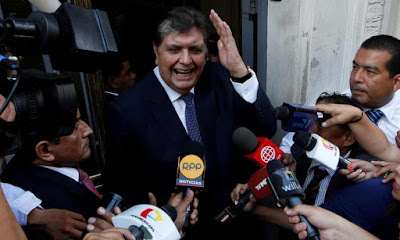 “President García has taken the decision of a free man,” to avoid humiliation by those intent on using him as a political “trophy”, Mulder said. García went into politics in the 1970s – after a period studying in Paris, where he is said to have supported himself by busking outside metro stations – and has been a towering figure in Peruvian politics ever since. His first term as president is widely remembered as a fiasco, ending in economic meltdown and a deadly security crisis involving the Maoist guerrilla group Shining Path. But García staged a dramatic political comeback in 2006, which some attributed partly to his rival’s endorsement by Venezuela’s then leftist leader Hugo Chávez.